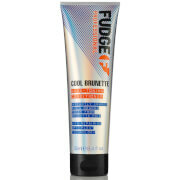 Preserve the intensity of your colour with the Fudge Colour Lock Conditioner. Rich and luxurious, the moisture-infused Fudge conditioner will intensively nourish your hair, whilst protecting your colour for up to 25 uses. Designed to shield your tresses against UV damage and reduce colour fade, it will leave your hair looking bright and feeling soft. - L.M. Aqua (water), behentrimonium methosulfate, cetearyl alcohol, c10-40 isoalkylamidopropylethyldimonium ethasulfate, cetyl alcohol, dimethicone, laureth-23, cetrimonium methosulfate, quaternium-91, cetearyl alcohol, cetrimonium chloride, hydroxyethyl cellulose, quaternium-80, propylene glycol, diazolidinyl urea, iodopropynyl butylcarbamate, polysilicone-15, ethyl hexyl methoxycinnamate, parfum, trideceth-12, cetrimonium chloride, amodimethicone, peg-100 stearate, glyceryl stearate, helianthusannus (sunflower) extract, butylene glycol, panthenol, lactic acid, hydrolysed silk, creatine, benzophenone-4, hydrolysed keratin, keratin, tetrasodium edta, paullinia cupana seed extract, moringa pterygosperma seed extract, glycerine, triethanolamine.